6 Jun 2016 Washington D.C.
McConnell’s comments come in the wake of recent attempts to ramp up the narrative that Trump is allegedly anti-Latino. For instance, during her recent foreign policy speech, Hillary Clinton reprised the attack that Trump “calls Mexican immigrants ‘rapists and murderers.’” However, what Trump actually said is that Mexico sends rapists and criminals across the border—which government data suggests is quite literally true. A 2011 government report found approximately three million arrest offenses attached to the incarcerated criminal alien population—which the report defined as an immigrant who has not been naturalized. Of these offenses, 70,000 were sexual offenses, 213,000 were for assault, and 25,000 were for homicides. The report notes that the majority of the 296,000 SCAAP [State Criminal Alien Assistance Program] criminal alien incarcerations in state and local jails were from Mexico. Yet most recently, the narrative that Trump is “anti-Latino” has tended to focus on two main stories: Trump’s criticism of the judge presiding over the Trump University case, and Trump’s criticism of New Mexico Governor Susana Martinez. However, just as the media failed to report on alien crime rates when discussing Trump’s comments about illegal alien crime last summer, so too is the media now leaving out critical facts about these stories. For instance, while Mitch McConnell, Newt Gingrich, and members of corporate media have attacked Trump for his criticism of Judge Curiel, they did not mention Curiel’s status as a member of the La Raza Lawyers of San Diego. La Raza literally translates to mean “the race.” Nor did they mention that Curiel “oversaw the gift of a law school scholarship to an illegal alien,” as the Daily Caller reported. Separately, the media rarely reports that the legal firm behind the lawsuit gave money to the Clintons. The Daily Caller notes that the La Raza Lawyers of San Diego is not a local chapter of the National Council of La Raza, and the San Diego group claims to protest the literal translation of its organization’s name— arguing that they are made up of different races. While it’s gone largely ignored by corporate media, Ann Coulter has pointed out the implications of Curiel’s decision to join a group that views his profession through the prism of his ethnicity— and joined, not just a Hispanic association, but a group that seems to have more explicitly racial connotations. Coulter tweeted, “Re: Trump University — Would liberals accept a white judge — under any circumstances — who was a member of a White Race organization?” Indeed, if the judge had been Caucasian and was a member of a Caucasian advancement group, one could imagine that anything the judge had ever said or written would be completely parsed out by the public. The significance of this is underscored by the fact that as a judge sworn to “faithfully and impartially” perform the duties incumbent upon him under the Constitution and laws of the United States, Curiel has been involved in subsidizing illegal activity by partially funding the college admissions of an illegal immigrant. The judge’s decision to involve himself in the furtherance of an illegal act, which comes at the direct expense of American citizens who need financial assistance, seems to suggest that on matters pertaining to immigration, the judge may perhaps be willing to place political and personal ends above legal ends. This fact could lend credence to the argument that in Trump’s case, Curiel is perhaps placing his political considerations above legal considerations. Similarly, McConnell, Gingrich and members of the corporate media have attacked Trump for saying that Gov. Martinez has “got to do a better job”. Gingrich went so far as to accuse Trump of going “off the deep end” for criticizing Martinez. However, both McConnell and Gingrich failed to mention that Martinez attacked Trump first—and not the other way around. The story was really very simple: Martinez hit Trump, so Trump hit back… In mid-April, the New Mexico governor issued a ‘remarkably strong rebuke’ to Trump, in the words of a Washington Post report, when Martinez spoke to a GOP fundraiser at the home of David Koch in Palm Beach, Florida. Martinez, according to the Post, ‘did not mince words.’ She told the crowd of about 60 wealthy GOP backers that, as a Latina, she was offended by Trump’s language about immigrants… Team Trump believes Martinez has continued to criticize him in private since those remarks. And when Trump traveled to Albuquerque, after having clinched the Republican nomination, Martinez told reporters she was ‘really busy’ and did not have time to attend. “Those are horrible things to say about anyone, or any culture, anyone of any ethnicity. I mean, that is uncalled for completely,” Martinez said. New Mexico’s violent crime rate rose 6.6% between 2012 and 2013 — the most in the nation — to nearly 597 per 100,000 residents. The increase in violent crime came despite Governor Susana Martinez’s avowal in 2011 to be tough on crime. Yet Gingrich, McConnell, and the media’s failure to emphasize that Martinez attacked Trump first has allowed his political opponents to falsely characterize his criticism. For instance, Hillary Clinton recently seemed to suggest that Trump’s attack was “gratuitous” and without prompting. “He insulted the Republican Governor Martinez of New Mexico, just gratuitously,” Clinton said. Some have argued that a consistent theme of this election is that the Republican establishment is more upset by Mr. Trump’s tone than they are by the dismantling of our nation’s immigration laws and the victimization of Americans that has accompanied it. 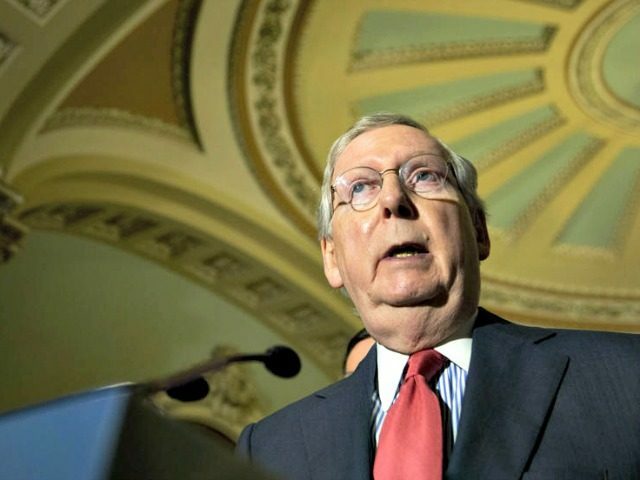 For instance, when McConnell was asked about Trump’s tone with respect to Hispanics, McConnell could have just as easily said that Trump’s policy to stem the flow of illegals and reduce the overall rate of migration would benefit low-income minorities, while Clinton’s plan would economically devastate poor American minorities. However, McConnell once again missed an opportunity to attack Clinton to instead seemingly signal to the media that his endorsement of Trump is merely perfunctory. Under Sen. McConnell’s leadership, there has been no serious effort to dismantle sanctuary cities, crack down on migrant benefits, ensure deportations of criminal aliens, or halt the influx of refugees. While Democrats have waged months-long campaigns over equal pay or other pet Democrat issues, no similar effort has been waged by Majority Leader McConnell to defend the integrity of the U.S. immigration system. When Kate Steinle was murdered, Senate leadership failed to even address the issue. In fact, at the height of national focus and public outrage about the issue, the Senate adjourned for its August recess without taking any meaningful action against sanctuary cities. By contrast, when the GOP wanted to push the passage of the Keystone pipeline, an issue their donors supported, “GOP’s Senate leadership mounted a long and emotional election-style campaign to win nine Democratic votes for their legislation to approve the Keystone pipeline,” the Daily Caller reported at the time. Moreover, on a factual note, McConnell’s declaration that “all of us came here from somewhere else,” suggests that he holds a starkly different understanding of Americanization than the one held by our founders. America was not founded upon an equal sampling of ideas from all different countries, but rather was founded on the ideas of one nation in particular, as well as a few Western nations that contributed to Enlightenment and Western thinking. Moreover, although McConnell believes “all of us came here from somewhere else,” today a lot more people are coming from certain places as opposed to others. Almost 90% of current green card allotments come from outside the normally recognized boundaries of the Western world.